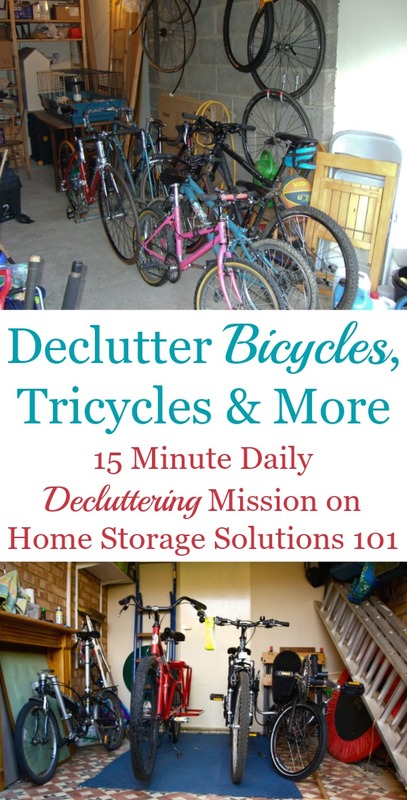 Today's mission is to declutter bicycles, tricycles, and other similar items in your home or garage, that are broken, outgrown, or that you do not use anymore. I urge you to consider bicycle donation ideas for any of these items so that someone will be able to enjoy them even if you don't. 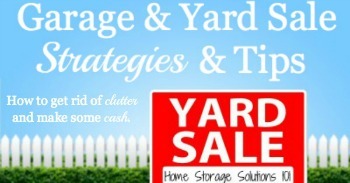 This mission is designed to be done while working on the Garage Organization Challenge here on the site, which is one of the 52 Week Organized Home Challenges. 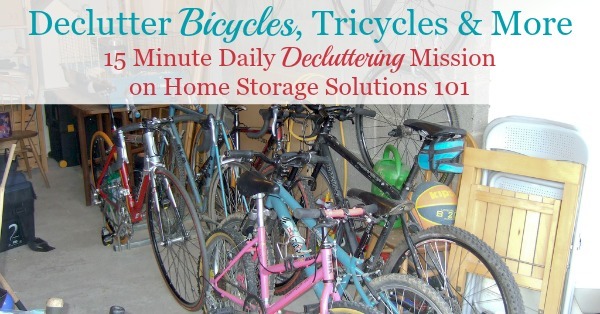 That is, of course, because often, but not always, people store their bicycles and similar items, from tricycles, scooters, skateboards, big wheels, and more, in the garage, or their storage shed. Wherever you keep these types of items in your home, today's the day to critically look at what you've got. I'm definitely not saying you should declutter everything. I never am. However, we often keep things that, for whatever reason, we no longer use. 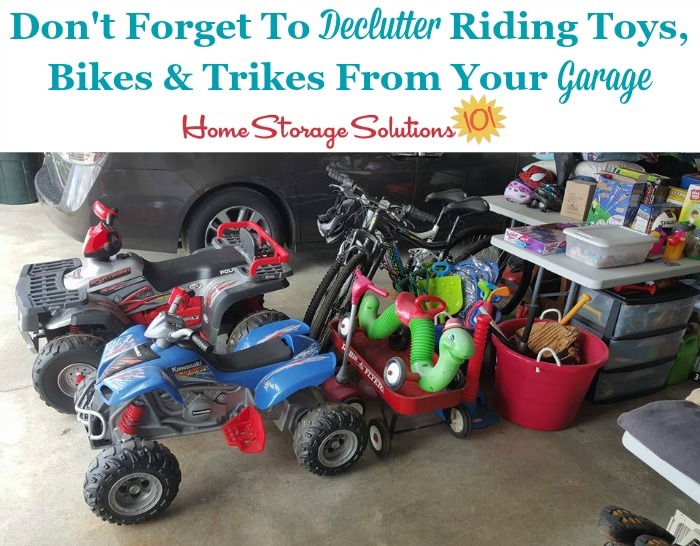 For kids bikes, and similar items like trikes, big wheels, and more, make sure your kids can still use these items, or that you're keeping them for a younger sibling as a hand me down for the future. However, if all the kids have outgrown the bike (and helmets) it's time to pass these items on to someone else to clear out space for yourself. I know it isn't just kids that have these items though. You may have your own cycling gear and equipment as well. For yourself, think about the last time you actually went out on a bike ride. enough to justify keeping it? If you do decide you want to keep your bicycles and other pedaled cycles, even if you haven't used them as much in the past as you wish, I urge you to make a commitment to pedal around the neighborhood, or something similar, in the near future, and more consistently to justify keeping the bikes. If you don't use your bicycles as part of your regular routine right now, but really want to incorporate riding a bike more into your normal lifestyle, I suggest going as far as adding some cycling dates to your calendar to encourage you to follow through with your commitment. Otherwise, if you don't have a desire to ride that bicycle anymore, and aren't willing to commit riding it in the future, out it should go. Someone should be able to enjoy it, even if you don't want to anymore. In addition, for those bikes you are keeping, today can also be the day that you tune up your old bikes, getting them ready for the cycling season ahead. Also, kids grow out of their helmets more quickly than you might imagine, so make sure each child (and you) have a well-fitting helmet to use while biking. Do this today and then make a note to buy new helmets if needed so when the weather is nice for biking, you're ready with all the appropriate safety gear. 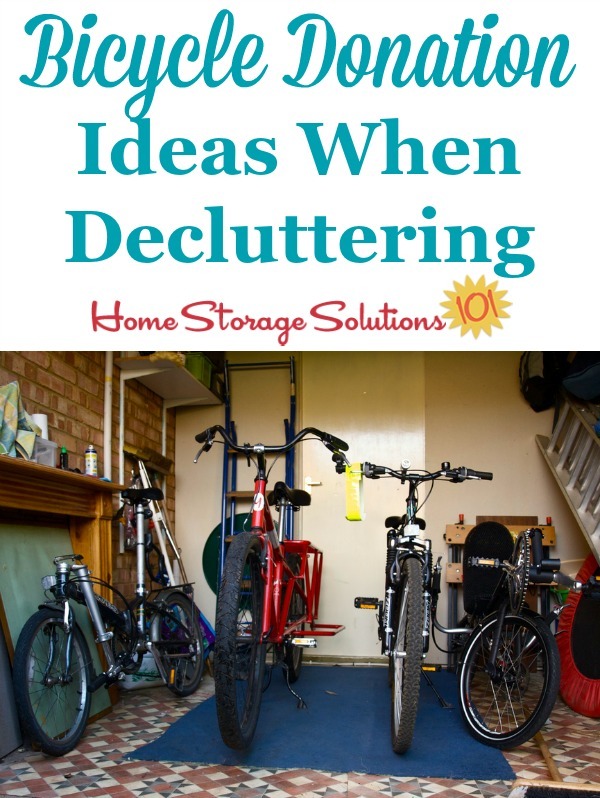 For any bikes and similar items that you do decide to declutter from your garage, make sure to read on below for some tips and ideas about what you can do with those bikes, including my personal favorite, which is donating them. Here's a picture from a Declutter 365 participant, Sarah, who already did this mission. She said, "I actually did this last year so I just had to take everything out, clean and put back. Only one small bike to get rid of, not too bad!" That's great Sarah! When doing this type of mission you need to evaluate, year after year, what you are still using versus what it's now time to get rid of. Eventually, once your kids outgrow them, some of those riding toys may go too, but for now, I hope everyone enjoys them! Should You Sell Used Cycling Gear Or Donate It? Bikes and cycling gear can represent a large investment of cash, so when you decide to declutter them from your home, even when it makes sense and will give you some relief from so much clutter, I completely understand wanting to get a little of your money back during the process. 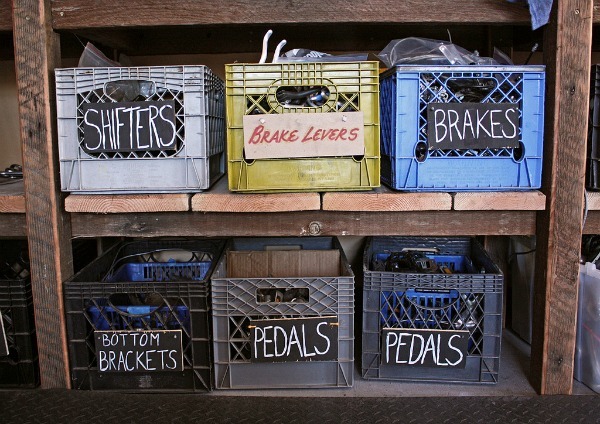 You can sell bikes at yard and garage sales, on Craigslist or Facebook buy and sell groups, or even take them to stores like Play It Again Sports, which buys and sells used cycling gear, spare parts, and used bicycles. And if you've got some extremely expensive professional cycling equipment, or one of those crazy expensive bikes, this may make lots of sense for you. On the other hand, typically used bicycling gear isn't going to bring you huge sums of money back in return for selling it, so if you can afford to be generous with a bicycle donation, I encourage you to do so. This is especially true of used kids bikes that have been well loved, are a bit beat up, and yet have lots of miles left in them that another child could enjoy. As I mentioned before, yes, these bikes cost you some cash to begin with, so think about others who really would enjoy and get a lot of use out of these types of items, but cannot afford even a used bike. Your donation could bring a child joy or give an adult a way to get back and forth to work more easily, for example. It is best to look locally for charities and organizations that are in need of bikes. You can always donate to general thrift stores, like Salvation Army or Goodwill, but many people like to donate to bicycle specific organizations in your area. These are the organizations that are almost always on the look out for bikes for kids and adults, plus spare parts to help maintain those bikes. My suggestion is to do a Google or similar search typing in your town or city, as well as a term like bike club or similar terms. This may help you identify organizations right in your area. Similarly, asking a business that sells biking equipment in your area may help you identify local organizations as well. 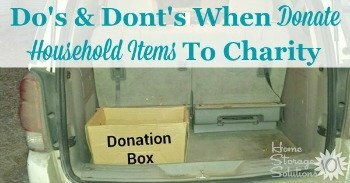 As always I'm not an advocate for donating junk or trash to charities. In addition, you don't want to donate bikes that are not in good working condition anywhere without disclosing any problems the bikes have to whoever you are giving them too, because these problems could be safety issues. On the other hand, as long as a charity or other group knows what the bikes are like that you want to give away, feel free to donate bikes that need a tune up or that really can't be used, as is, at all. The reason? Many of these bikes can either be fixed up by volunteers or workers for the charities, or the bike could be used as spare parts in fixing up other bikes. 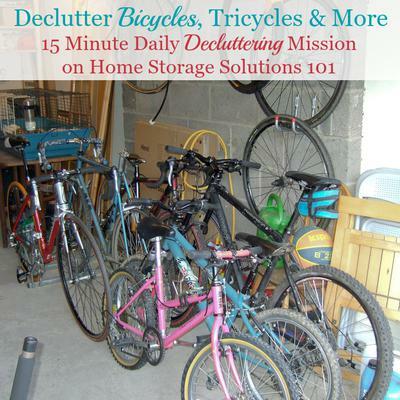 I hope this information has inspired you to get rid of your bike clutter in your garage or home. I live in SC and we found out when we were cleaning foreclosed homes that some of the local police stations take the bikes to refurb and donate to the less fortunate. I would also check the fire departments and see if they would take the bikes for donations. It's worth a look into if that is what you want to do. It's just an idea for anyone who might want to go this route. Happy Organization. The Boise bicycle project is awesome in Boise Idaho. They will repair and refurbish bikes. Look them up. Also I know a lot of refugee centers also take bikes to help out with transportation to those new in our country. My husband and I recently moved across the country and donated bicycles that we couldn't afford to move with us to a local university for their international students to use. Many foreign students have no way to get around other than on foot and a bicycle is really helpful for them. Plus, the university can use it over and over again, since the students likely will not take the bike with them when they graduate.